U2 are taking a break from their massive eXPERIENCE + iNNOCENCE stadium tour for a more intimate setting: a private performance at Harlem’s Apollo Theater. The concert, hosted in conjunction with SiriusXM, will be held on June 11. 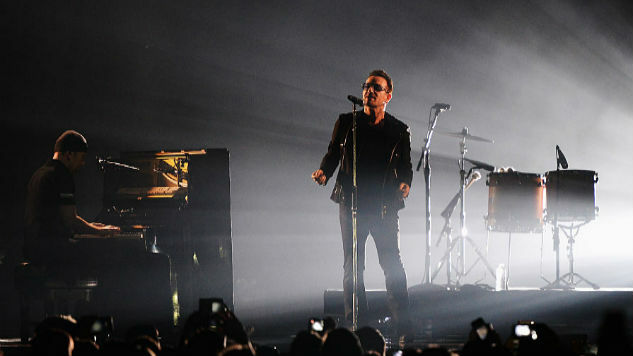 Over the course of their 42-year-long career, U2 have never performed at the Apollo. Frontman (and sunglasses icon) Bono expressed his excitement about playing at the historic venue in a statement, saying, “The Apollo Theater is the heart of New York’s musical soul, and to finally be playing our songs on the same stage where James Brown begged ‘Please, please, please’ is not only a bucket-list moment, it’s an incredible honor.” The theater opened its doors in 1934. Immediately following the performance, the concert will be streamed for SiriusXM subscribers via satellite, the SiriusXM app and siriusxm.com. SiriusXM subscribers should keep an eye out for an invitation sent by e-mail to win tickets to U2’s private performance. For information on the band’s, ahem, less intimate shows, read Paste’s take on how U2 redeemed the stadium show here. SiriusXM subscribers can stream the concert here. Check out a complete list of the stops on U2’s eXPERIENCE + iNNOCENCE Tour below.